‘Pretty Little Liars’ Season 7 Spoilers: Is Alison DiLaurentis Pregnant With Elliot Rollins’ Baby? As season 7 of Pretty Little Liars comes to an end for the mid season, PLL spoilers tease that it will be revealed that one of the liars is pregnant. Spoilers have indicated that one of the liars will be pregnant and it will change her life forever. 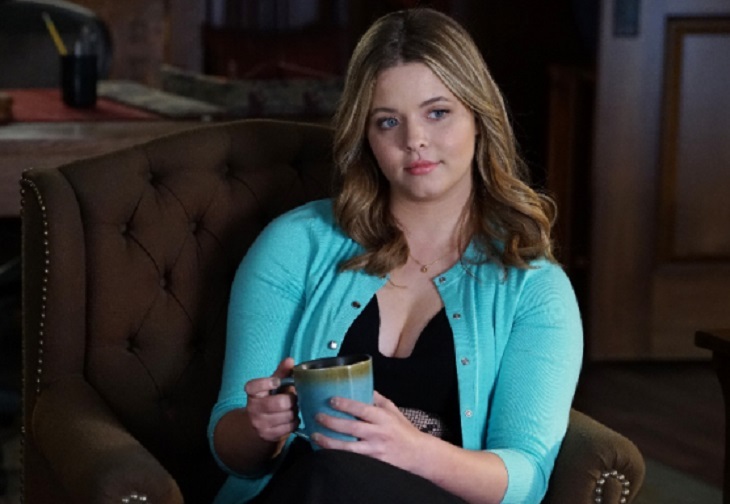 Is it possible that the liar that is having a baby is Alison DiLaurentis (Sasha Pieterse)? Are she and Elliot, aka Archer Dunhill, (Huw Collins) having a baby? Related: Season 7 PLL Theory – Aria Is “Uber A” And Mary’s Daughter, Does “A.D.” Stand For Aria Drake? Elliot was never a good match for Alison. He married her to control her and to get her money. He worked with her aunt Mary (Andrea Parker) to get Alison’s money from her. In addition to stealing her money, he made her go crazy. She ended up going to the hospital where Elliot ended up treating her. Alison managed to get away from him when the liars believed that they killed him. Unfortunately for the ladies, he may still be alive. There were past rumors that one of the liars was going to be pregnant at the end of the season. There are Pretty Little Liars spoilers that indicate that Alison is the one that is pregnant. If she were the one that is pregnant, she would be torn over what to do about the baby. This pregnancy will change her life. Considering who the baby’s father is, she could have an abortion or give the baby up for adoption. Alison wants to have a family because she has lost the majority of her family. Her family has been through a lot over the years. The only problem is she doesn’t want to have a family with Elliot. He tried to destroy her life. If Elliot is still alive, he could still be working with Alison’s Aunt Mary. Mary is determined to destroy Alison’s life. If Alison is pregnant, Mary will most likely take her baby from her to replace the one that died. Mary has been looking to destroy Alison for months and this will be the perfect way for her to ruin her life. Elliot could also take the baby from Alison to make her pay for leaving him. Related: Julian Morris Returning To ‘PLL’ Season 7 As Wren Kingston! Is Alison the one having the baby? If Alison is the one that is pregnant, will Mary or Elliot take the baby from her? Will Alison keep the baby or hide it from everyone? Viewers will find out who is pregnant when the midseason finale airs on August 30th. Get Exclusive Pretty Little Liars News & Updates! ‘Bates Motel’ Spoilers: Max Thieriot Dishes On Season 5, How Will Dylan React To Learning Norman Killed Their Mother?